Entries for this topic close at 10:59 AM Thursday, New York time as displayed on this clock. The FaithWriters Writing Challenge is a great way to improve your skill by writing to topic, word count, and deadline. We encourage you to think outside of the box, have fun and be creative with your entry. It’s simple to enter, and your writing skills will be sharpened. There will be eight topics each quarter, with a one-week break (to catch your breath) between weeks 3 & 4 and between weeks 6 & 7. 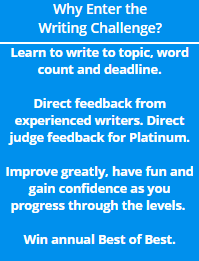 Entry to the Writing Challenge is always open to GOLD and PLATINUM members, who may enter once per topic. SILVER members receive four credits with their SILVER membership. These credits may be used to enter the Writing Challenge at any time during their SILVER membership. For more information about the Writing Challenge, please visit the Challenge forum HERE. Please read our Guidelines for Choosing a Level before submitting your entry. For maximum growth, learn how you can receive direct feedback from the judges on your entry and the eight rating categories they utilize HERE. Winners are announced HERE on the Thursday following a topic closing date and on the FaithWriters' Message Boards in the WRITING CHALLENGE RESULTS FORUM. Your entry will appear in your profile the day the winners are announced. The top three entries submitted each year receive a BEST OF THE BEST AWARD, with cash prizes on offer. First place will win $100.00, Second place will win $50.00, and Third place will win $25.00. The Best of the Best winners are announced on July 1 each year. Please review the SUBMISSION RULES, and GUIDELINES FOR CHOOSING A LEVEL, which appear in popup windows. Also visit the WRITING CHALLENGE FORUM on the FaithWriters' Message Boards for up to the minute information about each topic. Entries close on Thursday at 10:59 AM (New York time), one week after the topic is announced, or when 200 eligible entries have been received for that topic. Winners for the closing topic will be announced one week later. SILVER MEMBERS, once you have used your four credits, don't miss out on all the Challenge fun. You can join in simply by upgrading to either a GOLD or PLATINUM MEMBERSHIP from as little as $5.95 a month. SUBMIT YOUR ENTRY to this week's challenge. Minimum 150 and maximum 750 words. The topic is: RAIN. Verify Your Current Challenge Submission HERE. Never miss that perfect challenge topic again. Let us email it to you every Thursday.